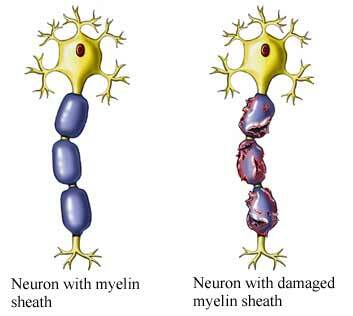 Multiple sclerosis (MS) is a disease of the nervous system. 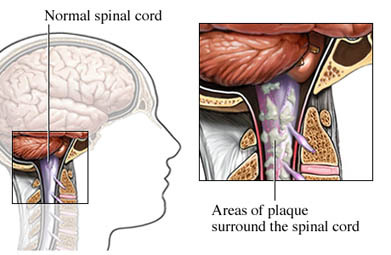 It causes swelling, harm, and scarring of the nerve sheath that covers the brain and spine. There can also be harm to the nerve itself. Relapsing-remitting—Problems return for few months or years, last for a few weeks or months, and then go away. They may get worse each time. Primary progressive—Problems slowly worsen after they first show up. They don't go away and come back. Secondary progressive—After years of going away and coming back, problems start to get worse. Progressive relapsing—Problems slowly worsen after they first happen. One or more relapses may also happen. What are the risk factors for multiple sclerosis?What are the symptoms of multiple sclerosis?How is multiple sclerosis diagnosed?What are the treatments for multiple sclerosis?Are there screening tests for multiple sclerosis?How can I reduce my risk of multiple sclerosis?What questions should I ask my doctor?What is it like to live with multiple sclerosis?Where can I get more information about multiple sclerosis? Frohman EM, Goodin DS, et al. The utility of MRI in suspected MS: report of the Therapeutics and Technology Assessment Subcommittee of the American Academy of Neurology. Neurology. 2003 Sep 9;61(5):602-611. Khan O, Williams MJ, Amezcua L, Javed A, Larsen KE, Smrtka JM. Multiple sclerosis in US minority populations: Clinical practice insights. Neurol Clin Pract. 2015;5(2):132-142. Multiple sclerosis (MS). EBSCO DynaMed Plus website. Available at: https://www.dynamed.com/topics/dmp~AN~T116285/Multiple-sclerosis-MS. Updated July 23, 2018. Accessed September 26, 2018. What is MS? National Multiple Sclerosis Society website. Available at: http://www.nationalmssociety.org/What-is-MS. Accessed September 26, 2018.